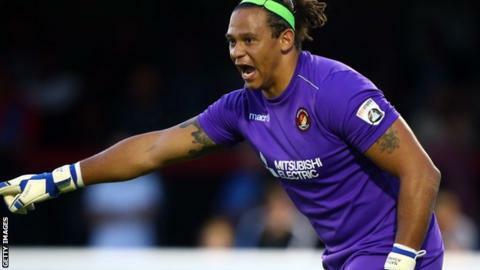 Derbyshire Police and the Football Association are investigating after a fan appeared to attack Ebbsfleet United goalkeeper Nathan Ashmore during their National League match at Chesterfield. After Will Evans scored a stoppage-time equaliser for Chesterfield, a group of fans celebrated by invading the pitch with one seeming to attack Ashmore. There have also been allegations relating to racial abuse. Chesterfield said the incidents at Proact Stadium were “not acceptable”. They added in a statement: “The club will fully co-operate with Derbyshire Police and the FA investigation which is now under way. “The implications for the club are very serious and an appeal is made to supporters to not engage in matters of pitch encroachment at any time. There have also been a number of serious allegations relating to racial abuse and physical contact involving opposition players. After scoring the equaliser in the 3-3 draw, Chesterfield defender Evans went in goal to save a penalty.